This entry was posted in PT and tagged notícia on July 31, 2012 by FEMEN. This entry was posted in RU and tagged блог on July 31, 2012 by FEMEN. 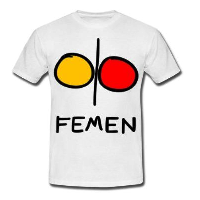 This entry was posted in EN and tagged news on July 30, 2012 by FEMEN. This entry was posted in ES and tagged noticias on July 30, 2012 by FEMEN. This entry was posted in PT and tagged notícia on July 30, 2012 by FEMEN. This entry was posted in FR and tagged nouvelles on July 30, 2012 by FEMEN.